For the past year or so I have been trying to figure out how to teach my boys about stranger safety. In preschool last year they learned all about fire safety and how to call 911. Their teacher explained that if something happened to me – like I fell and hit my head in the shower – they would need to call 911 to get help. I was really glad they talked about it because I hadn’t really thought about teaching them any of that. For the next few weeks following their safety lesson, the boys would ask if I was going to fall and hit my head every time I got into the shower. So, even though I knew they need to learn how to stay safe, I didn’t want to scare them. However, I also realized that if something happened to them because I didn’t properly educate them on how to be safe — well, I would never be able to forgive myself. I now realize that it is imperative that they learn about stranger safety – whether it scares them or not – so I decided to bite the bullet and just do it. But how? How do I explain the difference between strangers, people they know and the handful of adults who Chris and I would entrust them with? This is a tough concept for little ones, so I went in search of something that might help me to at least start the conversation. The first item I had was a Winnie the Pooh book called Safe at Home with Pooh. 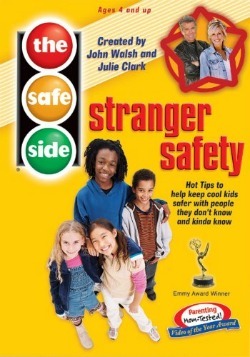 I actually didn’t buy this book with the intention of teaching the boys stranger safety. I just bought a stack of with books from the consignment store and it wasn’t until they asked me to read it that I realized what the book was about. It teaches kids not to talk to strangers and never to open the door to strangers (something I have mentioned that I don’t even do). The book was easy for them to understand and it helped get the conversation started about strangers and being safe. As I was researching materials that might help me teach the boys about stranger safety I happened upon the website: The Safe Side. I was delighted to see two familiar faces smiling back at me. The first was John Walsh, the host of America’s Most Wanted and one of the founders and key supporters of the National Center for Missing and Exploited Children. The other face I recognized was Julie Clark — the creator of Baby Einstein. These are two people who I believe to have the best interest of children in mind and the experience to create a program that would give children the tools they need to stay safe and to do it in an entertaining way. Of course, I decided to watch the program before the boys did just to make sure I thought it was age appropriate for them. I was relieved to see that it was highly entertaining and really great at teaching kids about “Don’t Knows” folks who are strangers and “Kind-of Knows” pretty much everyone else your child might interact with such as coaches, teachers, neighbors, family friends, doctors, librarians, etc. >N was actually very reluctant to watch the video, which made me hesitate a bit but I knew we really just needed to watch it and start discussing how to stay safe. I told him that if he thought it was too scary I would turn it off. Since I watched it before they did, I knew that they would think that “Safe Side Superchick” was really funny. She provides really important information and does so in a fun and completely goofy way. The boys both loved it and they actually asked to watch it again today. We had fun not only discussing what they should do when certain situations happen but acting it out as well. Another thing the video recommends is that you pick three adults who you completely trust with the well being of your child and put them on a list. This way if something happens and you cannot get to your child, they will know it is okay to go with one of these people but no one else! Then there is a clear distinction of who it is okay to go with unless you (their Safe Side Adult) tell them it’s okay or they ask permission first. 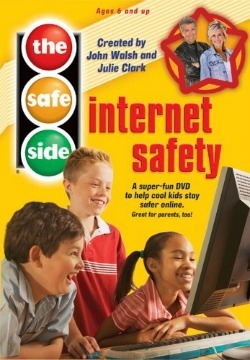 They even have a Safe Side video all about internet safety. This isn’t really an issue for us right now because the boys don’t use the computer but I will probably have them watch this once they are a little older. The only thing is it might be outdated because it’s from 2006 but I’m sure the basic tips are still relevant. So my plan is to keep talking about how to stay safe, letting them know that they can come to their Dad or I if something doesn’t seem right or makes them uncomfortable and that it is okay to yell fight, hit, kick and whatever else they need to do if someone ever grabbed them. By teaching them about safety I hope that this will help the boys to be prepared if God forbid something did happen! So what have you done to teach your kids about stranger safety? What books, programs or websites have you used? I’d love to hear what others have done or recommend!